Another interesting breakfast/lunch recipe. Though it might look like a long process, it takes about 30 -40 minutes, to get it all done and serve. 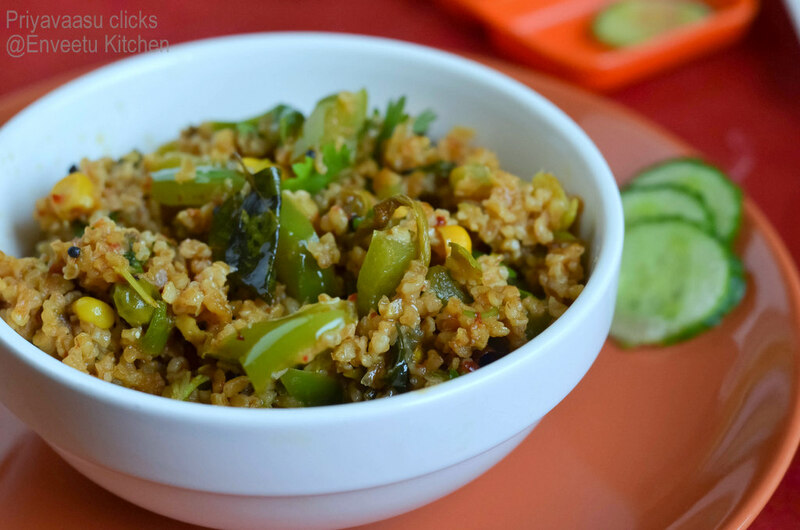 Gothumai rava/Wheat rava is pretty easy to cook. I just soak it in boiling water for 10 minutes, drain and it is ready to be sauteed with anything you want. To make things easy in the morning, you can blanch the rava the previous night, drain and store it in the fridge. 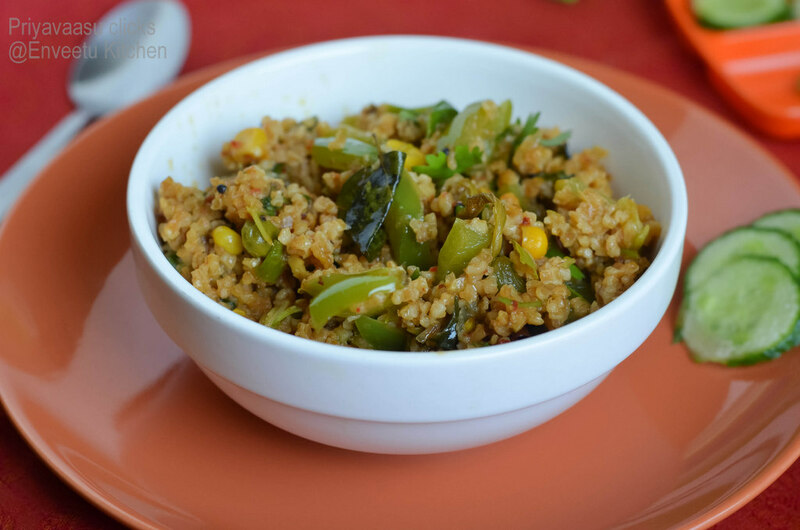 Sending this to delicious upma to Eat Nutritious, Feel Fabulous, a monthly event by Jagruti. Boil 2 cups of water in a pot, when it is rolling boil, add lapsi/gothumai rava to it. Switch off the stove. Keep it covered for 20 minutes. After the given time, the rava/lapsi would have absorbed the liquid and bloomed well. Drain the excess liquid and keep aside until use. In the time, the rava/lapsi was resting, prepare the vegetables. Heat a pan with oil, given under "tempering", splutter mustard seeds, add hing, turmeric and curry leaves. Next add the chopped onion, garlic, ginger and green chili. Saute until onions turn translucent. Next add the chopped tomatoes, add 1/2 cup water, followed by red chili powder, coriander powder and salt. Let it cook until tomatoes becomes soft and mushy. Next add the chopped vegetables, mix well. Cover and cook for 8-10 minutes, until the vegetables are cooked and the liquid is almost dry. Now add the drained gothumai rava/lapsi to this and mix well. Cover and cook for 10 minutes for the flavors to mingle. Let it sit on the stove for another 5 minutes or until it is almost dry, without cover. Take it off the stove, garnish with coriander leaves and serve hot with Raita and pickle. i loved the composition very nicely taken . 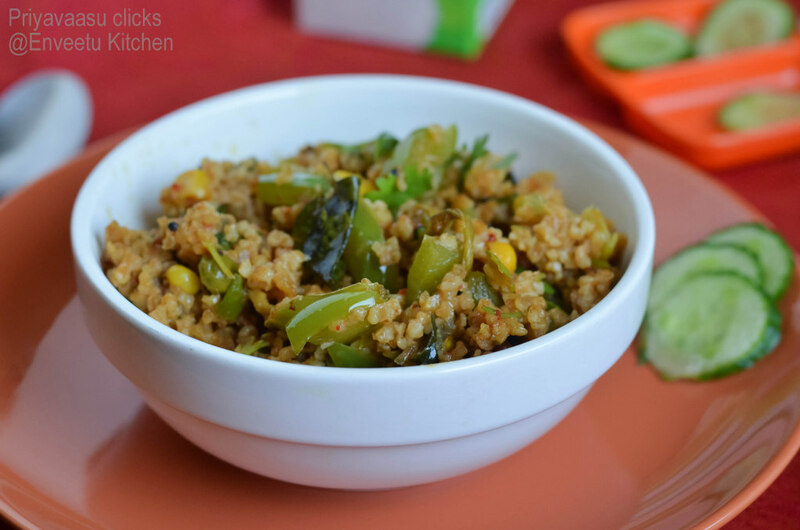 I love this Upma..often cooked in my kitchen..so healthy and tasty ! 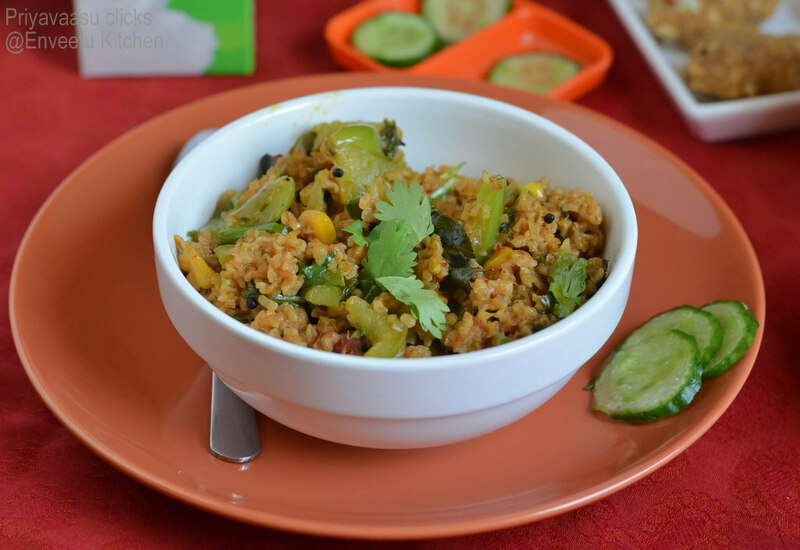 Very delicious and yummy wheat upma with veggies :) Looks very inviting ! !